I just got caught up on this series, and until a few chapters ago, I wasn’t thinking about which girl had the final goddess inside them. Somehow, I got the idea in my head that Akari held one of the goddesses until I looked it up and found out she was in the Runaway Spirit Squad. So I’ve only just begun to think about whether it will be Ayumi or Chihiro, or someone else entirely. From what I’ve heard people say, the fact that Keima currently believes the goddess is in Chihiro means that it definitely isn’t there. Now, I’ve read enough Liar Game to understand that train of thought, but there’s something else interesting about that idea. Let’s assume that for that theory to be true, Keima has to successfully romance Chihiro, since otherwise there wouldn’t be a fakeout. If that’s the case, though, then wouldn’t he end up with a love interest whose memory WON’T disappear? What happens then? Of course Keima already has a number of love interests, like Haqua and Tenri, but none of them are open about their feelings. There’s a great difference between having someone who secretly likes you and someone who actively believes you’re in a relationship with them. Even with the other goddesses, there’s the implication that their hosts will forget about him after this arc is over, and the goddesses themselves don’t seem to be in love with him. Having an actual romantic relationship with a girl falls outside of Keima’s comfort zone. I can’t imagine what would happen if Chihiro’s memories didn’t go away. The first thing that comes to mind is Keima attempting to intentionally break off the relationship without creating another hole in her heart, or an intentional bad end. That doesn’t seem like an action Keima would take, though, since he treats attaining girls so seriously. I also doubt he’d try to have her fall in love with someone else, since that would just be a rehash of her first arc. And if he did stay with her, how would that work? It’d be interesting if she found out about his mission with the runaway spirits, but that’s also unlikely, and it doesn’t seem to fit the style of the series. Of course they might just have Haqua or Elsie remove her memories manually, but aside from maybe having them yell at him for suggesting it, that just feels like the lazy way out. I’m still not completely sure who has the goddess inside them, if either does. I have a weird theory that it’s inside that fourth girl from the band club, but I don’t have any real evidence yet. 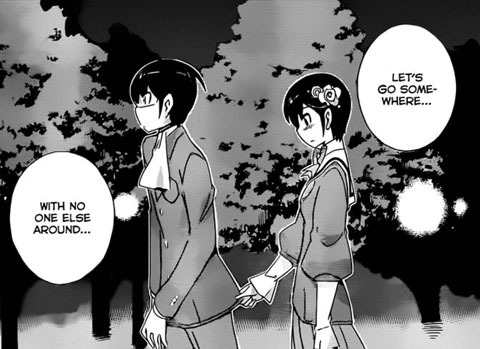 At this point, I’m more concerned with how Keima’s relationships with Ayumi and Chihiro will end up. Both of them seem to be falling for him, which means that something is likely being built up beyond simply finding that last goddess. I just hope Keima knows what to do if he ends up with two girlfriends he can’t get rid of. Posted on November 3, 2011, in Chapter Discussions, Series, The World God Only Knows and tagged Ayumi, Chihiro, goddess, Kami Nomi zo Shiru Sekai, Keima, relationships, romance, The World God Only Knows. Bookmark the permalink. 3 Comments. I’ve read quite a bit of spoiler on the story till now, and I’m really considering to pick up the manga! On many chapters in the story the episodic captures end and the real story begin? They start hinting at a larger story shortly after the anime ends, but it isn’t until chapter 110 or so where the bigger plot starts up. It’s still somewhat episodic, but it blends together a lot better. In the end I decided to order all the volumes! They will be home next week (21 November)! I’m quite confident I will like it!